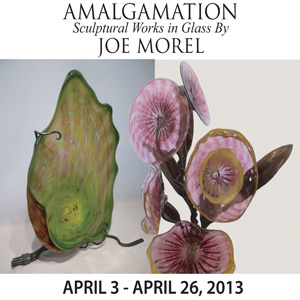 Throughout the month of April, Arts Visalia is proud to present Amalgamation, an exhibition of sculptural works in glass and metal by Jospeh Morel. Included in the show are two recent bodies of work by Morel as well as a small group of works by some of his recent and current students. In Arts Visalia’s main gallery space are the most recent works by Morel, glass forms reminiscent of natural forms, some suggestive of floral forms, others reminiscent of sea life. These brilliantly colored glass forms are mounted on hand-forged metal housings in the shape of leaves and vines, some being mounted onto the gallery walls while others sit upright on pedestals. A second, smaller body of work titled the Inheritors, is displayed in a smaller, dimly lit gallery. These works, mixed media creations of glass, metal and LED lighting, depict the microscopic forms of spores, mold, fungi, viruses, bacteria and toxic microbes. Strikingly different from the works in the main gallery space, these works represent a masterful combination of glass forms and complex metal designs, delicately lit with their own inner glow of light. These mysterious creations are both beautiful and ominous in their intricate designs. Joseph Morel began his career as a glass artist at California State University, Chico in 1971. Graduating in 1973, he found employment at Orient and Flume Art Glass, an internationally renowned glass studio in Chico, where he was mentored by visiting European glass masters over the next seven years. In 1980, Morel opened his own glass studio where he was able to grow as a glass designer. For twenty-five years he owned and operated Zellique Art Glass in Benicia, California. Zellique Glass was renowned for Morel’s designs; simple and elegant, impeccable in quality. The art glass which was produced by Zellique was represented in galleries and museums in all fifty states and exported to galleries and collectors in Canada, Europe, Australia, and Japan. Glass creations by Mr. Morel are in private collections of President Clinton, Vice President Quayle, countless Hollywood celebrities as well as heads of state in England, Holland, Canada, and Japan. Zellique Art Glass was presented as gifts of state from the United States, the Canadian Prime Minister, and Japanese delegates. In the summer of 2005 Morel closed his studio in Benicia so he could focus on teaching. He felt it was time to “give back” and share his talent and life experiences through teaching. Morel now lives and works in Fresno, California, where he works as the glass instructor at California State University, Fresno.